They are quiet, discrete, and arguably the most efficient way to control the climate in any home. In this article, we'll show you how to pick the best strategy for your home while providing links to all of the possible equipment you'll need. Named for their split design, a ductless mini split system is a comfort solution used for countless HVAC installations the world over. Consisting of an outdoor unit and one or more indoor units, mini splits can be utilized as a standalone system, supplemental system, or for dedicated rooms. Their ductless design provides flexible and compact installations making them ideal for almost any application. Some installations include bringing a mini-split into unconditioned spaces such as garages or additions and they can also be in used rooms that are under-served. Mini Splits are perfect even for historical homes without ductwork as a complete heating and cooling solution. With sound ratings as low as 19 dB, mini split units can operate at sound levels quieter than a whisper. This means your mini split will not only be unobtrusive, but you may even forget it's running at all. Energy Efficiency = Savings By combining several energy-saving technologies, mini splits are one of the most energy-efficient ways to keep your home comfortable all year round. Inverter-driven condensers cut down on waste by delivering precise amounts of heating or cooling required to keep your space comfortable thus minimizing energy costs. Compared to conventional central-air equipment, mini splits use advanced control algorithms, intelligently-designed heat exchangers, and inverter-driven compressors to save you 30% or more on energy bills and achieve incredible efficiency ratings over 28 SEER. Mini splits with inverter technology are more efficient and maintain more even temperatures than traditional HVAC systems. Unlike traditional systems which are either ON or OFF, inverter-driven units can vary the amount of cooling or heating they deliver. This means that instead of cycling and swinging from too hot to too cold, a mini split will deliver continuous heating or cooling -- virtually eliminating temperature variation and keeping you perfectly comfortable all the time! As an added benefit, they even remove moisture the entire time they're running, making your home even more comfortable. equipment-related tax benefits and credits under many circumstances. These rebates vary by state and Zip Code. Find out which rebates you qualify for by using this free energy rebate wizard. Before you go off and try to purchase a mini split, you'll first need to decide if you want one that will do both heating and cooling or one just to cool the air. Choosing a heat pump versus an air conditioner is pretty simple. Cooling-only mini split systems are typically found in tropical or desert climates as well as special applications like server rooms. Mini split heat pumps are the most popular choice as they can be used anywhere to cool in the summer with the option of heating in the winter. When the temperature outside goes to extremes, it can inhibit a mini split system's capacity. Just as extreme heat in the summer makes it difficult for an air conditioner to cool, when temperatures drop below freezing in the winter, capturing heat also becomes difficult. In either case, there is a decline in both efficiency and performance which is why it's important to get the proper-sized equipment and be prepared for every season. 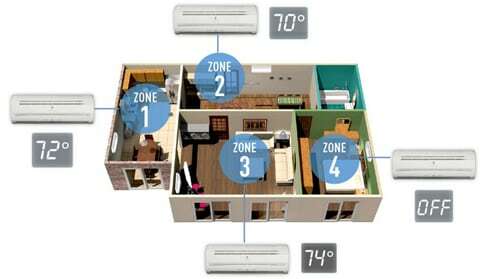 Another key benefit of mini-split systems is the option to zone your home into multiple areas. The ability to zone your home with a mini split system gives you tremendous control and flexibility over your home’s environment. You are able to condition only the spaces you need when you need them while controlling each space independently. Single-zone systems are simple, consisting of a single outdoor unit and indoor unit. These types of systems are ideal for adding cooling and heating to previously unconditioned spaces or to supplement under-served spaces in an existing system. 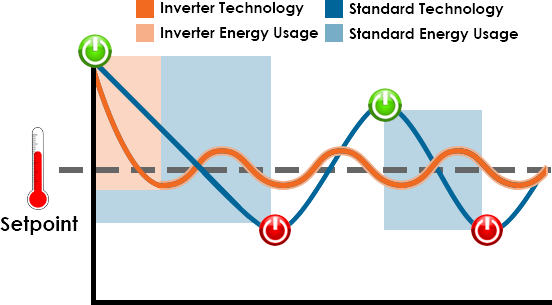 The only drawback is that single-zone systems cannot be converted into multi-zone systems at a later time. Multi-zone systems consist of a single outdoor unit with up to 8 indoor units giving you a combination of control, comfort, and efficiency that no other system on the market is able to match. Each indoor unit operates independently of the others in the circuit, providing you with individualized comfort in each space. For example, you can turn off your laundry room unit until laundry day, or you can adjust the unit in your kitchen when you're cooking a meal - the possibilities are endless. There are multiple types of indoor units available to serve your home's needs. The indoor unit(s) you choose should be based on your home's layout as well as your aesthetic preference. It's equally important to have all of the necessary components in order to install your mini-split equipment as it is to get the best quality parts to ensure top performance. From line sets to condensate pumps, you'll learn everything required to install your custom system. Installing HVAC equipment is highly technical and best left to the professionals. Take it from us, finding the best contractor to install your equipment is essential to ensure years of reliable service and warranty coverage. You don't want to go through all the trouble of getting the best equipment just to have it improperly installed and not work properly. 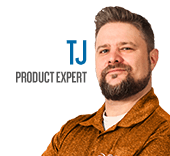 Now that you know which system and various components you need, the next step is figuring out what size mini split will be best for each room in your application. To get into that "Goldilocks Zone", you'll need one that's just right - not too small and too large. One of the best things about mini-splits is that they're infinitely customizable, giving you thousands of options from which to choose. So, how do you pick the best one? Luckily, our mini split system builder is a quick and easy way to find the right system for your home. Since you already know the sized system you're looking for, simply enter your specifications and you'll be able to view a list of systems perfect for your space. The Ultimate Mini Split Buyer's Guide - How to Pick the Perfect Mini Split. Our heating, ventilation and cooling equipment how-to library can help you pick the perfect comfort solution for your home.